In My Mailbox #14: The End of the Parasol Protectorate, WWII, and ROBOTS! So far I've had a very bookish weekend. 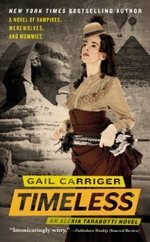 I stayed up until 4:30am Saturday morning reading Dan Wells' Partials (review coming tomorrow) and then I had the pleasure of listening and meeting Ms. Gail Carriger at BookPeople last night. It was great fun and she's super nice. I'm eagerly anticipating when my schedule can fit Timeless into the reading rotation. Now I'm trying to clear out browser tabs, listening to Panic! at the Disco and getting organized for my week of... doing stuff. Do you know how ineffective dancing in your desk chair to Panic! at the Disco is to writing a blog post? Let's just go with "very". Despite my usual avoidance of mainstream fiction/chick lit, I have had a soft spot for World War II homefront stories (true and fictional), so thanks to Random House for sending me a review copy. I got an assortment of other books, primarily regarding web design and inbound marketing strategies, so I'll spare you those. Just know I have bruises on the insides of my elbows from all the library books I carried to my car.